Woke and walked Mix before breakfasting in the farmhouse and chatting with Cathy – getting all the news about her family. Then David and I got on with some of the bits and pieces that need to be done. 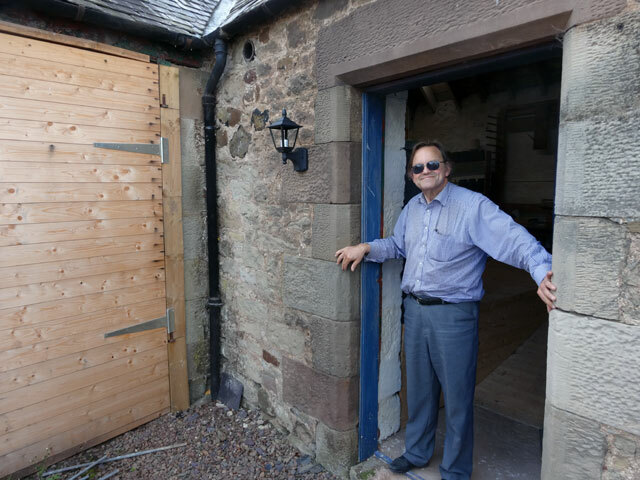 David worked on completing the Stables while I continued sorting out the music files prepared over the last fifteen years. Once David had completed his job and we had enjoyed some coffee together, we set about positioning the eight lamps with which we shall light the courtyard. David drilled them and we can start the wiring on Monday. I arranged for a large skip to be delivered on Monday morning so that the tidy-up can get underway. While David was away in Berwick for lunch I made a serious dent in the music files. On his return and after the work was completed for the day we sat and blethered over a coffee. Then, when David went off to his home, I took Mix for a walk before supper. 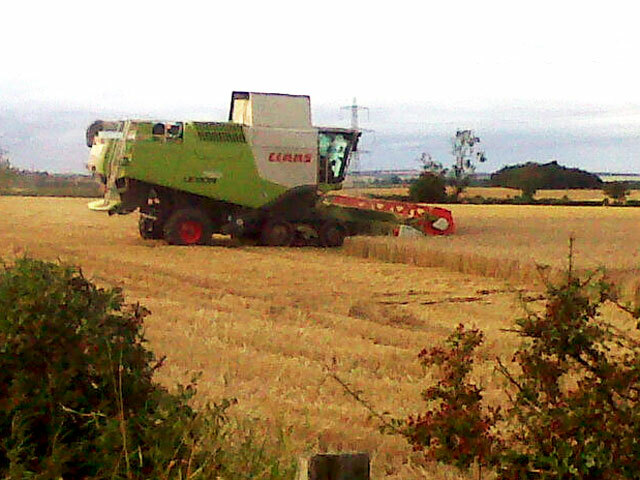 In the field opposite there are now three tractors in operation: one is a combine harvester gathering in the grain – I didn’t have my camera but I took a picture on my telephone, not so good but I hope it gives the idea; a tractor was following the combine harvester. It appeared to be cutting down the stalks (presumably for straw or cattle feed) and finally there was a tractor cutting the hedges in the field from the inside. Clearly all the farm workers and contractors are working extremely hard. I sat and looked through my diary for the last year and was amazed by all that we have done and achieved. A picture brings back so many memories and I have at least one for every day of the year. Although Rachel and I didn’t move in here properly until the end of October of last year, Mum, Olive and Digger moved in on 4th. September so our first year of ownership of Mount Pleasant has almost been completed. It has been a wonderful year. Scott joined us for supper tonight: Sue is up with her parents in Dundee. It was good to see him and to get all of his news. Sue’s Mum is seriously ill and all of our thoughts are with her and the family. It’s strange how things happen – happy and sad all bound up together, concern for Sue’s Mum while Katie enjoys such a triumph at the Fringe or, on a world stage, the joy that so many people are getting from the Edinburgh Festival’s three thousand plus shows while fighting and disaster, famine and helplessness are beamed into our televisions from the Middle East. We live in a world of such stark contrasts and it is not easy.